The Time War will forever remain one of the defining events within the Doctor Who universe, actions in the classic series setting the scene for the ultimate confrontation between the Time Lords and the Daleks and events in the modern series dealing with the fallout both for the Doctor and for the universe at large. In a sense, having the Time War occur off-screen was a masterful decision in terms of building the character of the Doctor from Christopher Eccleston’s portrayal onward and letting the series reinvent itself without being tied explicitly to previous continuity, but that choice also left a glaring hole in the franchise’s overall mythology that short accounts could never fully explore. With the surprising introduction of John Hurt for the fiftieth anniversary special as an incarnation of the Doctor who had forsaken his name because of his wartime actions, the first glimmers of the actual fighting were offered, opening the door for further adventures with this mysterious figure in Big Finish’s own The War Doctor run of series. But as ‘The Night of the Doctor’ made clear, Paul McGann’s Eighth Doctor was also reluctantly involved in the Time War, and now his involvement is allowed more thorough exploration with a sixteen-story epic of his own beginning with The Time War 1. John Dorney’s ‘The Starship of Theseus’ opens events, finding the Doctor and his companion, Sheena, ready to enjoy a holiday when they land aboard the titular luxury space-liner just as it’s about to leave the Jupiter spaceport. Wisely, the presence of mysterious creatures under the bridge at a time when passengers continue to go missing certainly sets the scene for a rather traditional tale as peculiarities begin to subtly manifest. However, the locale strangely warps about them and the two find themselves instead on a refugee ship fleeing the fringe of the Time War itself, amplifying the threat and danger immensely and providing the perfect entry point to the Doctor who has not yet even considered committing to fighting. It seems clear from the outset that the confusing temporospatial effects of the Time War will form a key component of this saga, and what seems like an established Doctor-companion relationship is revealed to be anything but as neither the Doctor nor Sheena remember meeting each other or how they came to be upon the ship. With a pre-credits sequence showing just how ruthless the Time Lords have become in this time of war and the Doctor’s true surroundings then revealing themselves in short order, the tone is quickly set for a dark and emotional exploration of the Doctor as he struggles to remain a pacifist onlooker as everyone around him becomes more afraid and more aggressive and not even Sheena proves to be safe from the ravages of war. Indeed, with an appearance first by a critically injured Time Lord who is seeking to fulfill his mission by finding the renegade who refuses to fight and then by the Daleks themselves who make a bombastic entrance where no action or death is off-limits during their merciless hunt, it’s clear that The Time War will not shy away from showing the ensuing carnage and emotional turmoil that will inevitably haunt the Doctor for the rest of his lives as the two sides continue to battle with little regard for the universe around them and the havoc that the resulting flux in timelines causes, an exciting proposition that presents plenty of storytelling opportunities going forward. Matt Fitton’s ‘Echoes of War’ directly continues the story as the Doctor and a motley group of refugees crash-land on a jungle world whose landscape is corrupted by time as it cycles through growth and decay. Fitton proves adept at mining descriptive explanations for the horrendous effects of the Time War, and the planet experiencing fragmented time and causality because of temporal napalm that destroys linear time is a fascinating description of both cause and effect on an innocent world. Sadly, it is eventually revealed that the true cause of the poisoned space-time, while surprising in its revelation and reasoning, is unsurprising in its intent as the Time Lords continue to devolve morally in order to gain the upper hand against their eternal foes. 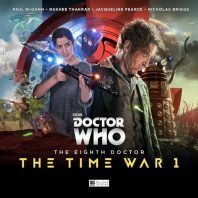 As the past and present collide upon the planet’s surface and Rakhee Thakrar begins to shine as the kind-hearted but fierce Bliss, ‘Echoes of War’ also manages to provide an unexpectedly satisfying Dalek tale that is unafraid of showing a more manipulative side of the Eighth Doctor that may just begin to come to the forefront more as the series progresses. Coming upon a Dalek with a corrupted memory, the Doctor is able to play upon its amnesia to ensure its cooperation as they together try to reach a temporal safe zone. This allows a surprisingly contemplative, reflective, and even philosophical discussion to arise about what it means to be a Dalek when it forgets its past, and a genuine bond and sense of respect begins to form between Dal and the other survivors as history and differences are slowly able to be put aside. Although this course of action brands the Doctor as a disloyal traitor in the eyes of some Time Lords, it also allows a superb discussion regarding the Time War and its combatants from the eyes of innocent bystanders who have no bias, lending yet another layer of depth to a thrilling second instalment. Matt Fitton’s ‘The Conscript’ finds the Doctor in wholly surprising territory as Cardinal Ollistra locks his friends away and conscripts him to join his fellow Gallifreyans in combat training for the ongoing battles around them. With Commandant Harlan a harsh, by-the-books leader who thrives on order and attention to detail, the dissident Doctor unsurprisingly provides a unique challenge that is anything but welcome in the camp. Yet while the first half of ‘The Conscript’ initially seems like a surprisingly light-hearted romp as the Doctor continues to mock authority and to bend the rules while secretly trying to reach his friends, it nonetheless manages to highlight the Doctor’s persevering sense of fairness and just how to make him fall in line, an aspect his true enemies continue to exploit through his travels to this day. The second half turns much darker, however, as the recruits take to training with the Doctor locked away for insubordination. With a mistake in orienteering revealing the presence of a Dalek drone that has managed to breach the Gallifreyan defenses, the inspiration that the Doctor’s actions unknowingly produced results in the death of a young recruit who tries to distract the drone before it can transmit its reconnaissance information. Though he was in no way oblivious to how serious the Time War was before, these facts hit the Doctor hard and bring about a grimmer and more determined side of the Doctor than has yet been seen, resulting in a surprisingly powerful confrontation with Ollistra when he again refuses to follow her orders. By its end, ‘The Conscript’ becomes a harrowing story of war that examines the general Time Lord views that are beginning to align with the Daleks’ sense of the absolute while also progressing the personal involvement of the Doctor immensely, expertly and emotionally setting the scene for the first quarter’s finale. John Dorney’s ‘One Life’ is tasked with concluding the set, once more amplifying the scale to show the true carnage that the Time War is able to wreak. Trapped first by a Dalek quantum wall and causality generator and later stranded on a world in a solar system subjected to hyper-evolution that changes their surroundings constantly as the nearby sun threatens to go nova, the Doctor and his companions are subjected to a multitude of challenges in addition to the Daleks’ attack that only this unique time period can provide and that constantly challenge their very core and will to survive. Yet as Time Lords are summoned and the Daleks continue their onslaught, it’s the presence of a secret weapon that even Ollistra does not fully know about that quickly becomes the driving force for ‘One Life.’ Tying directly back to ‘The Starship of Theseus,’ Dorney plays with prior assumptions and reveals that the Doctor’s presence is only a coincidence and that Quarren Maguire is instead the rebel that the Time Lord agent and the Daleks were initially seeking. Quarren was deemed at one point to have the greatest psychic potential ever recorded, an ability that could be harnessed to alter reality itself. Realizing that his abilities could be weaponized over and over again, he decided instead to hide his true identity away, to immerse himself in a world of his creation where he could live and love without being put into that impossible situation even once. As the destruction and terror around him worsens and the Doctor becomes doomed to die, however, he decides to sacrifice his created life to save the Doctor while defeating the Daleks, unable to fully eliminate collateral damage in the process. While this does become a sort of deus ex machina ending the modern television series has utilized when putting the Doctor into an inescapable situation, David Ganly plays the tortured Quarren magnificently as he slowly decides to use his potential before eliminating himself from the timeline as well. By blending the innately personal tale of Quarren with the intrinsically impersonal nature of war in general and pitting those aspects against the Doctor’s own sense of morality, ‘One Life’ becomes a fittingly resounding conclusion to The Time War 1 that brings the Doctor ever more deeply into the conflict. The Time War is obviously an era filled with countless battles in which innumerable weapons are used and lives are lost. While it’s a thrill to be offered a glimpse into this tumultuous period of the Doctor’s life as he does his best while struggling to remain uninvolved despite being doomed to failure, it’s the smaller and quieter moments that provide just as much impact as the bigger set pieces in this first box set. With incredible performances from all involved, strong direction, and evocative and powerful sound design, the shifts in tone and scale are handled with ease and create a thoroughly rewarding experience from beginning to end. Indeed, ‘One Life’ proves to be an apt title for the finale of this set since each story features one key death that impacts the Doctor more than the ongoing fighting between the incessant Daleks and the Time Lords who are becoming more like them as time progresses ever could. Both bombastic and contemplative, straightforward and surprising, The Time War 1 is a thrilling and engaging entry to this highly-anticipated series and sets the bar high for those sets yet to come.